Continuing its long-running collaboration with Wallpaper*, Alberto Guardiani commissioned London-based set designer and artist Robert Storey to create a special installation for its recently redesigned Milan store during Salone Del Mobile. For the past three years Wallpaper* has been collaborating with Italian shoemaker Alberto Guardiani. We’ve made a special edition line of footwear, a belt and a capsule collection of luggage. 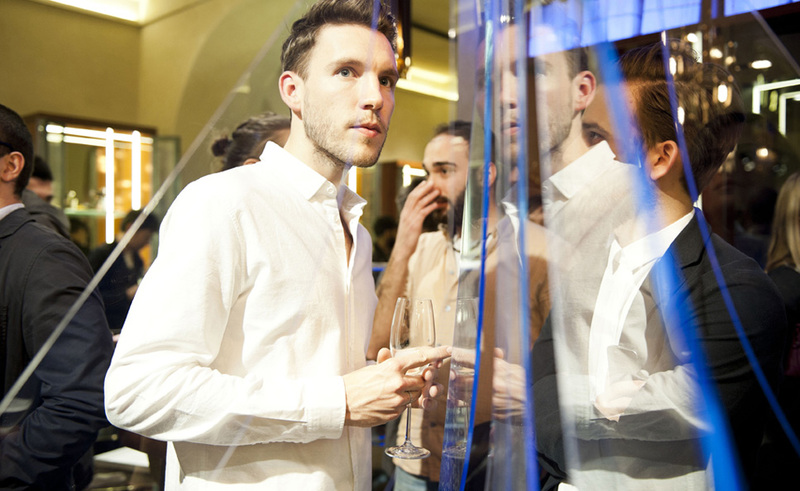 For 2014, Guardiani asked Wallpaper* to create an installation and a window display at its flagship store in Milan. Impressed by his Folded Reflections Suspended piece for the Opening Ceremony store in London’s Covent Garden and his work for Nike New York and Vionnet during Paris fashion week, we chose acclaimed set designer and artist Robert Storey. The brief was simple: interpret the Alberto Guardiani ‘brace’ logo (a version of the curly parenthesis from a computer keyboard) in a dynamic and attractive form. Storey employed light-diffracting Perspex cut into to multiple brace shapes to build a central installation and shop window display. Referencing Alberto Guardiani’s brace, we called the project In Parenthesis. The project’s grand unveiling was the perfect excuse for a party – the Wallpaper* Alberto Guardiani In Parenthesis cocktail event proved to be a highlight of the Salone del Mobile week. Wallpaper*: Tell us about the Wallpaper* / Alberto Guardiani installation. Robert Storey: Alberto Guardiani’s new store design uses blue LED lighting and reflective materials. So we used live-edged acrylic in shades of blue and made multiple cut-outs which all slotted together. I hoped to create something graphic yet clean and simple. W*: How did you incorporate the Alberto Guardiani ‘brace’? RS: We used the brace shape in the windows by turning it on its side and multiplying it to make it more graphic. We then made a cut-out inside the acrylic shapes, again in the brace shape, so when the acrylic live edge lit up, it made an infinity effect. We did the same for the sculpture in store, cutting it out of the sculptural shape, making it reflect itself. W*: Did you get to see anything else at Salone? RS: My favourite presentation came from the ECAL students. I also stopped by the Wallpaper* Handmade exhibition and loved the speakers by Alexander Mulligan and the chocolate boxes by Patternity and Toby Winteringham.